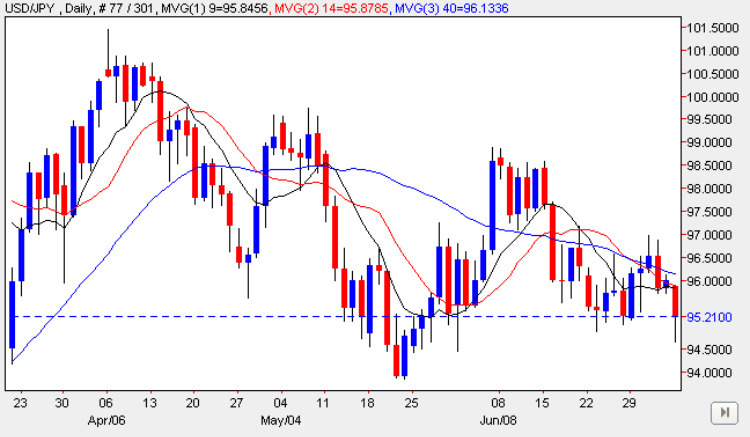 The general bearish slide in the yen to dollar pair continued yesterday as we move inexorably towards our initial target of 94 on the daily chart at which point we may consider the options for trading the pair once again. At present the USD/JPY pair is failing to correlate with any of the major European crosses taking a lead, instead, from the Yen crosses which are providing an interesting selection of trading opportunities but coupled with volatility can make these extremely lively to trade. With no fundamental news on the economic calendar for either the US Dollar or the Japanese Yen the pair is likely to be confined to a narrow trading range unless the equity markets recover some of their recently lost momentum.